To wrap up the birthday weekend, the parents came over to spend the day. 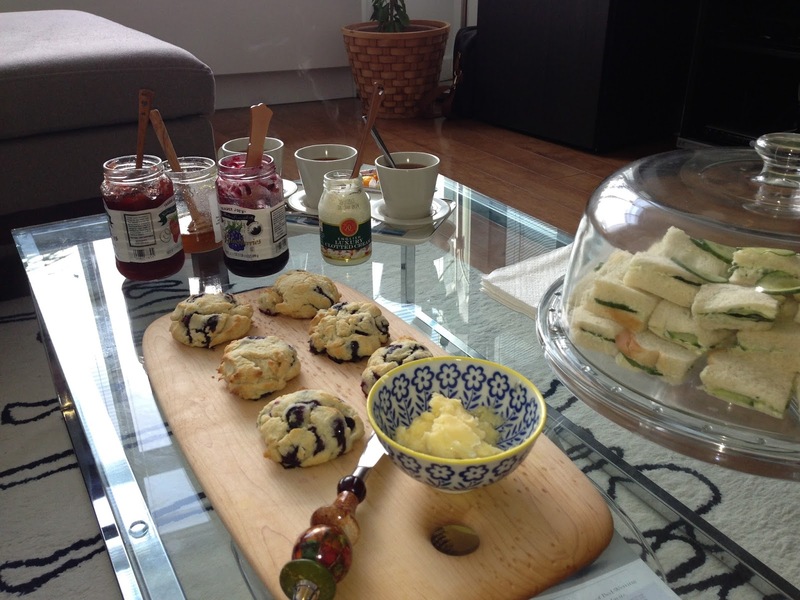 After a delicious lunch and a stroll, it was home for a post-prandial nap only to wake up again and get our afternoon tea on! The scones were deliciously crumbly with the honey butter, clotted cream, jam, and honey. Leaving them in the fridge overnight and baking them fresh at 425 for 15-18 minutes was definitely the right call! And to go with the pie (instead of birthday cake - it turned out pretty darn tasty!) we had some refreshing cucumber sandwiches. I don't know what it is about crustless white bread sandwiches cut into quarters, but somehow it feels like you're eating air, and suddenly you realize you've just consumed half of an entire loaf. Yeesh. But delicious air! Disregard the beautiful bowl of mint leaves - I meant them to go into the sandwiches, but when I tasted one (of many) trial sandwich, I decided they were great without any additional mint. Besides, otherwise we wouldn't have had any Strawberry Mint Fizz! 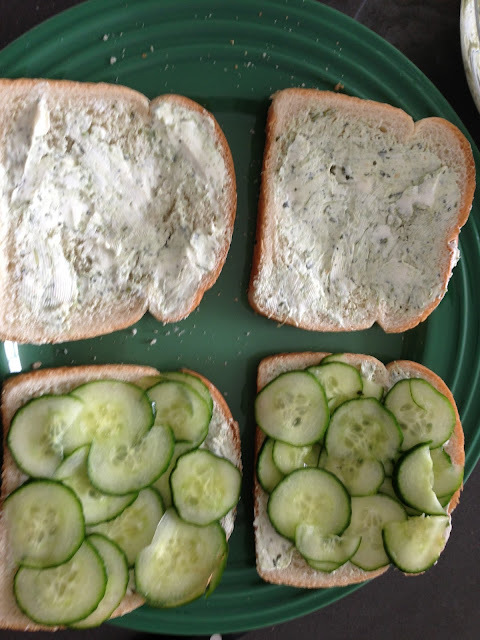 You'll notice that the bread is still wearing its crust here - this was one of the first ones, but I soon realized that cutting the crust off after making the sandwiches was resulting in losing some of the yummy spread as well as some of the cucumber - not to mention ragged edges! So de-crust before you construct the sandwiches. Slice the cucumber thinly (our mandoline came in handy for making quick work of it! ), then salt generously and leave aside to drain for at least 20 minutes. 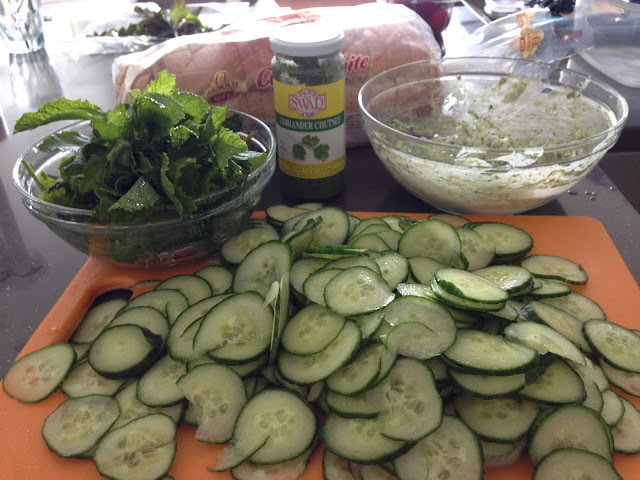 In the meanwhile, combine cream cheese and coriander chutney making sure it's an evenly mixed spread. Cut the crusts off all the bread with a serrated knife (leave the end bits for making breadcrumbs or toast later - we want these to be pretty!). 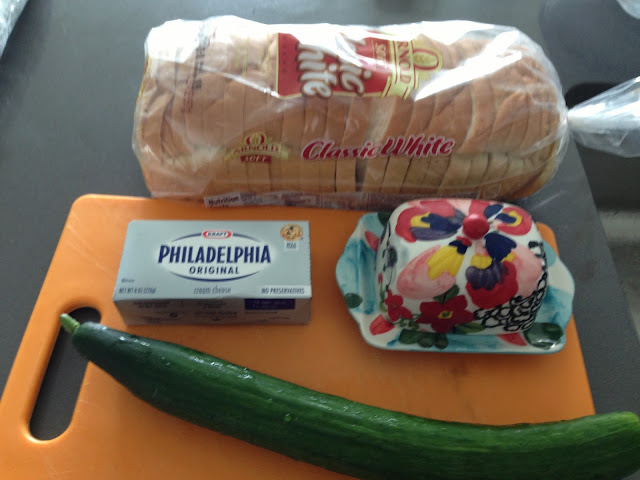 Spread the cream cheese and coriander mixture on one side of all the bread slices. This will help to keep the cucumber's moisture from soaking into the bread and making it soggy. Plus the delicious creaminess makes these so soft and fluffy. 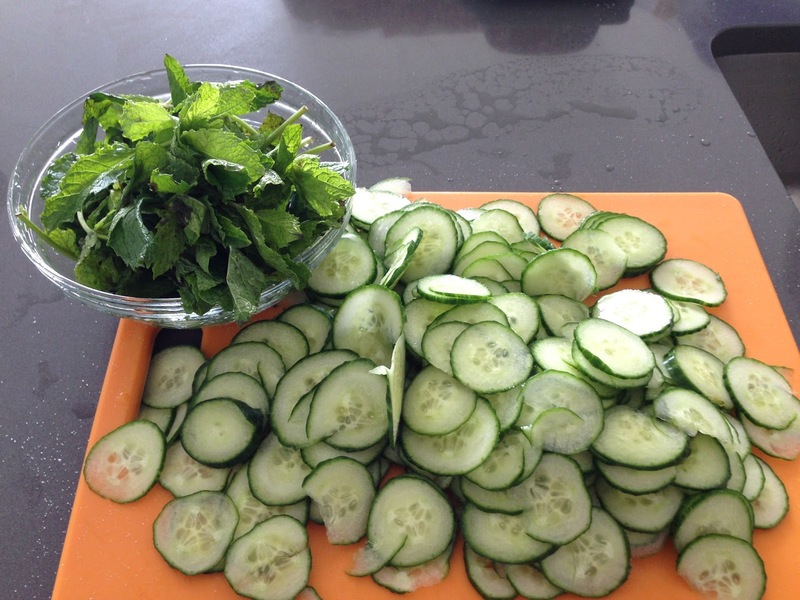 Pat the cucumber slices with a paper towel to mop up the excess liquid (you don't want the sandwiches to get soggy!). 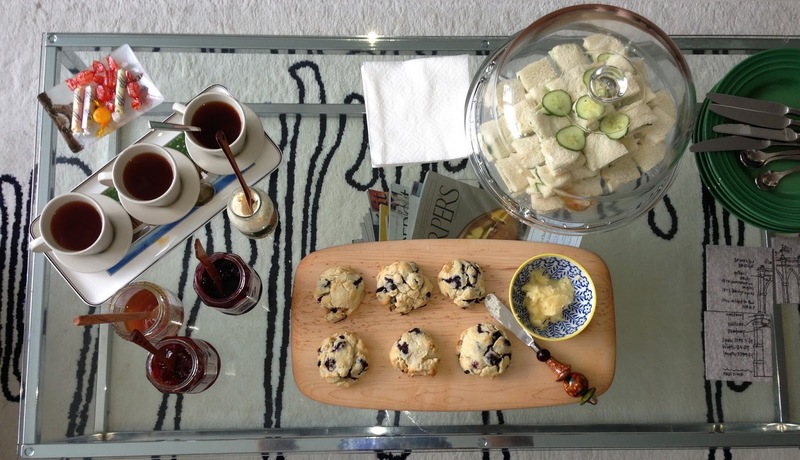 Then arrange them on the bread, top with another slice, and quarter for mini tea sandwiches. Just a double layer of cucumber slices (or maybe triple if your slices are extremely thin) is enough - any more and they start feeling too bulky to be the airy little nibbles these are meant to be. Finally, inhale them as fast as you can! Just FYI: I made these in the morning and they kept beautifully until the late afternoon in airtight containers with parchment paper between sandwiches.